Is dry January getting you down? Well, we’ve just the pick-me-up treat for you! Introducing this months guest post: Seven year old Kim from Manchester. Also known as Kim The Cooking Lady. This cupcake Queen films her cooking vlog at home with the help of Simon, her faithful camera man and dad. Having always enjoyed watching other kid vlogger channels, she decided to give it ago herself. 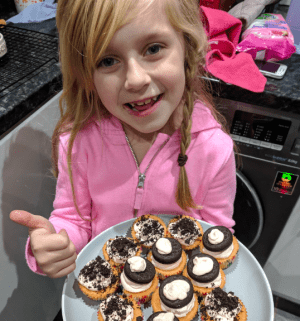 Sharing her love for cooking, whilst also having fun making treats for the rest of the family. We think this cooking lady is a mini celebrity in the making. So, are you ready for a sugar over load? We challenge you to find anything sweeter! Why not have a go at making some cupcakes yourself. Kim and Co have kindly offered up their ultimate cupcake recipe. If you’re in need of more guidance you can find the first episode of the series at the bottom of this page. Don’t forget to subscribe! She’s an absolute star isn’t she!